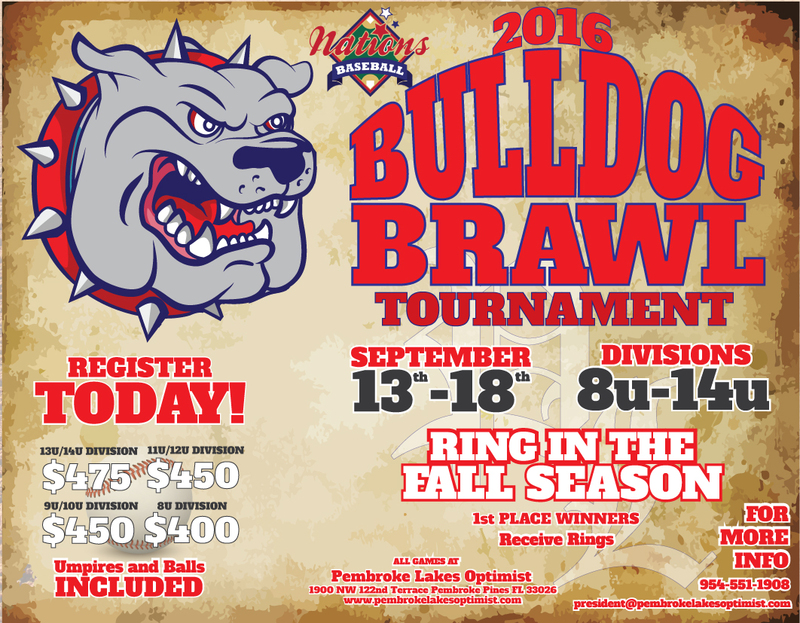 The 2016 Bulldog Brawl is a Nations Baseball sanctioned tournament event being hosted by the Pembroke Lakes Optimist Baseball Program. The games will be played at the fields located at 1900 NW 122nd Terrace, Pembroke Pines, Florida although other games could be played at other local field should scheduling require. All teams are guaranteed three (3) games (Weather Permitting) and all games balls will be provided by the tournament. Additional information listed on the tournament flyer below (OBTAIN TOURNAMENT FLYER IN HANDOUTS). Call 954-559-1908 or email president@pembrokelakesoptimist.com for more details.